There are many challenges that face Russia today, not only of reclaiming the power it once had as the Soviet Union, but even of keeping the country intact and together. These challenges could have a huge affect on Russia's actions and status in the future. Here's a video that gives a few points onto Russia's geography problem. There are some mistakes in this clip - for example Russian GDP per capita is something about 20 thousands USD, not 9 thousands... and some others like "they will have to cross Urals". Actually, Urals are "mountains" only by name, you may not even notice them while crossing. As for "flawed geography", they didn't even mention the main (IMHO) flaw - harsh climate, which is actually the serious economic problem: with other things being equal, Russian agriculture will always be less productive and industry will always be more costly (and thus less competitive) than, say, European analogues. Not such a big problem by itself, but becomes more and more dangerous with globalization: as long as there are any foreign alternatives, investments in Russia itself becoming pointless. And this lead to constant outflow of capital. Therefore, the vaunted globalization is nothing but direct and existential threat to our economy and the very existence of Russia as strong and independent nation. Not such a big problem by itself, but becomes more and more dangerous with globalization: as long as there are any foreign alternatives, investments in Russia itself becoming pointless. And this lead to constant outflow of capital. Interesting, You do often give me insights into Russia that might not otherwise occur to me. So $7,500 for 2016 might be right, I'm not sure (but it's definitely not even close to 20 thousand). Nominal GDP is a much more reliable because it sets a fixed standard; much better to use for us outside of Russia because we can compare it with other countries. and some others like "they will have to cross Urals". Actually, Urals are "mountains" only by name, you may not even notice them while crossing. The guy is talking about a land army crossing the Urals during the nineteenth century, yes they would've presented an obstacle. I backpack in the Adirondack Mountains of New York State and the White Mountains in New Hampshire, I know how hard it could be, and the Urals I'm sure are much more remote and harsh, even if they're not high. Yup, they didn't mention that among many other things. I read somewhere (can't remember where) about how Russia's river system presents more of an obstacle than a benefit for shipping goods. Most of Russia's major rivers (the Volga, Ob, Yenisey and Lena) flow south to north and drain into the frozen Arctic Ocean, so they can't be reliable trading routes. Unlike the U.S., which has the Mississippi River that flows through the heart of the country and major tributaries spreading out on either side. Of course, here you are using nominal GDP, which is a measure of economic strength when measured in USD. To see a more objective picture, you would have to look at the GDP at PPP. At PPP, the GDP per capita of Russia is around $24,000, with the total GDP being around $4 trillion. ^^^ My bad, got the two mixed up. Yeah PPP is the one best to compare. That's the one that should've been referenced in the video (especially if we're talking about standard of living). Sorry PhoenixRu. So about $24,500 in 2015. ^^^Yet when we quote sources from inside Russia that are critical of Putin they are labeled traitors and not representative of Russia This only demonstrates that the only acceptable line for some is that which praises Putin. Coincidentally, (or may not such a coincidence) this is the same criticism generated about historical analysis of Stalin. So, history simply repeats itself over and over with no lessons ever being learned. Of course I'm not Russian, but just from what I've seen of him in the media and the actions he has taken he seems to be a very ingenious, subdued and astute leader; the opposite of Trump. He's been very effective at keeping Russia relatively stable up till now in the face of so many forces that are pulling at it. But there's only so much he can do, like any other leader, and these forces are creeping up on him. ^^^A pity you deleted your rant. Although I did not completely agree with what you said, it was a good healthy let me get this off my chest sort of observation. I finally came back to present my counterpoint. Oh well. I guess I just have more of a taste for arguing and debate than do most people. From indications I have read, he has also been brutal, ruthless, and relatively intolerant of opposition. I would hate to think that those things go together with the accomplishments you have cited. Of course, those written sources I have read are labeled as being very biased in some quarters, so it very much is one of those who do you trust kind of things. Speaking strictly for myself, I certainly do not trust Putin. Still, he may very well have pursued economic policies that helped Russia get back on its feet. In that way at least he may have alleviated a lot of suffering. Alternatively, Russia may very well have been in a good position to bounce back from some very hard times, and Putin may have simply been lucky enough to be there to take the credit. RUSSIA IS FIGHTING FOR ITS SURVIVAL. combined with growing internal unrest. In the Cold War, Moscow was a comfortable 1,700 km or so from the edge of the Warsaw Pact and enemy lines. The Soviets had ample naval access to the North Sea and Mediterranean. Russia has lost most of its important naval access (remember that most of Russia's coastline is frozen for parts of the year). Latvia, a NATO member, is less than 600 km from Moscow. Estonia is only about 140 km from Saint Petersburg. That would be like if Dallas was the American capital and the Warsaw Pact went right up to the Mexican border! For Russia it's unacceptable. The defeat in the Cold War and the pain and hardship that followed is still fresh in Russian's minds. 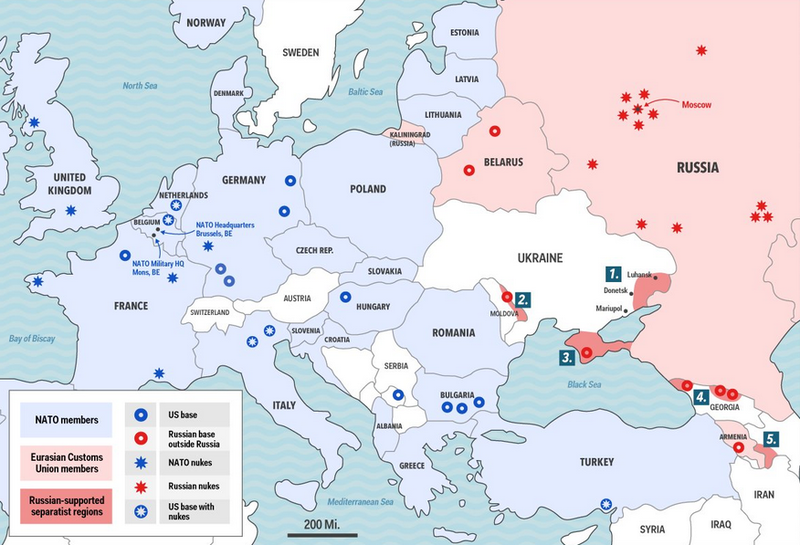 NATO was made to try and contain the Soviet Union, and yet it's still been expanding in Eastern Europe. So naturally Russia would be terrified that the Americans are still trying to contain them. So Putin went and tried to stop Ukraine from having a pro-Western government and bring that country, along with Belarus, into the Russian sphere. If it wasn't for these two countries, Moscow would've been wide open to invasion from Western Europe, through the Northern European Plain. If you back an animal into a corner, what do you think is gonna happen??? It comes out and tries to defend itself. That's not being aggressive. As for purges, the purges of the Stalinist probably did more to weaken that country than to strengthen it. Moreover, it is difficult to see why they are needed today except to keep Putin in power. Fear as a coercive tactic works, but it is not the most desirable way to do things. That is not just a moral argument, but an argument related to efficacy as well. Moreover, it is difficult to see why they are needed today except to keep Putin in power. So oil prices have recently dipped below $50 US dollars a barrel, lowest since November. Despite everything OPEC has done to try and prop them up. Russia’s economy, heavily dependent on oil, is suffering and will continue to suffer from low oil prices. Unlike a lot of other major oil producing countries like Canada and the United States, the Russian economy is centered on energy exports. Exports of crude oil, natural gas and petroleum products accounted for a whopping 58% of Russia’s GDP in 2015. Over a quarter of Russia’s exports alone are crude oil: http://www.tradingec.../russia/exports. So it’s easy to see that any fluctuations in oil prices would have a huge effect on Russia. Most of these exports go to the European Union and China, both of which are also facing massive problems in exports. The Russian economy in the 2000s was built on the assumption that oil prices would remain high, and with high prices and so high GDP growth Russia could then diversify its economy. But that hasn’t happened. Russia’s GDP has now dropped. History often repeats itself. In the mid 1980’s oil prices also took a plummet…. So Russia is caught between a rock and a hard place. What has Putin needed to do to keep the country together and propped up? Putin is the wrong leader for Russia at this point. He's merely a strongman, a political concept best relegated to the past - a tool of fear to keep the massive country glued together. Russia needs a leader that will pave the way to divestment from fossil fuels into renewables and burgeoning technologies. Also, a leader that will just resign to the fact there is really no point to keep antagonizing the West and just... let go. Counter-intuitive, yes but necessary for the "immolation" into a newer, better Russia for its own citizens. If this also requires breaking up Russia into several countries, so be it. There's nothing shameful about it. ^^^ Yes. Anybody notice how Trump played not only to Putin, but to the fossil fuel industry here at home? Mind you, Trump probably does not lay awake at night worrying about the plight of unemployed coal miners. Best let market forces finish off that industry. Better yet, let it finish off that industry while persuading the victims to vote Republican in future elections. Once a mark, always a mark. Another snow flake. Another sign that winter may be coming.